I recently held a small Easter ham dinner and besides the usual plates of pickles, cheese, and olives, I made a big batch of deviled eggs. I didn’t care if nobody ate them, because I am addicted to them and would gladly eat them all. I didn’t realize that one of the guests had never tried them and thankfully, she loved them! She even asked for the recipe. Deviled eggs have been a staple at family dinners and generally it’s just a handful of ingredients thrown together. Below is a recipe that you could alter in anyway desired. Add chilies, use different flavoured Boursin, capers, lemon zest, pickles, the options are unlimited. 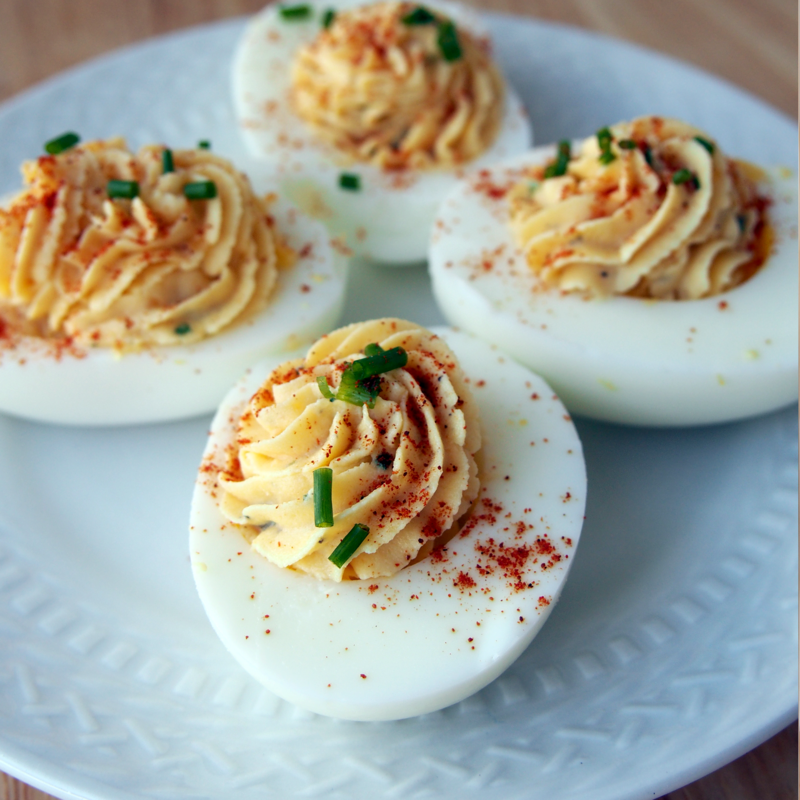 The side bonus of deviled eggs (besides being absolutely delicious) is that they are low carb and high in protein. Just a note that it always looks like you won’t have enough filling, but trust me there is. Feel free to overstuff the eggs with lots! Once cooled, peel and cut in half. Combine the yolks, Boursin, oregano, paprika, mustard, and some of the mayo. I like to use a hand mixer to mix it together. I add enough mayo until it gets to a smooth and piping texture. Add the chives, and salt and pepper to your desired taste. Put the filling into a piping bag with a larger sized tip. Pipe into the hollows of the egg whites. Sprinkle with a touch more paprika and some chives. Set in fridge to chill until serving. * Make a couple extra as sometimes the eggs don't peel nicely or cut cleanly. ** You can make deviled eggs a day ahead. Just keep the egg whites and the filling separate until a couple hours before serving. Put the egg white halves in a bowl and cover with saran wrap. You can put the filling in a piping bag, with a bit of plastic wrap on the tip.